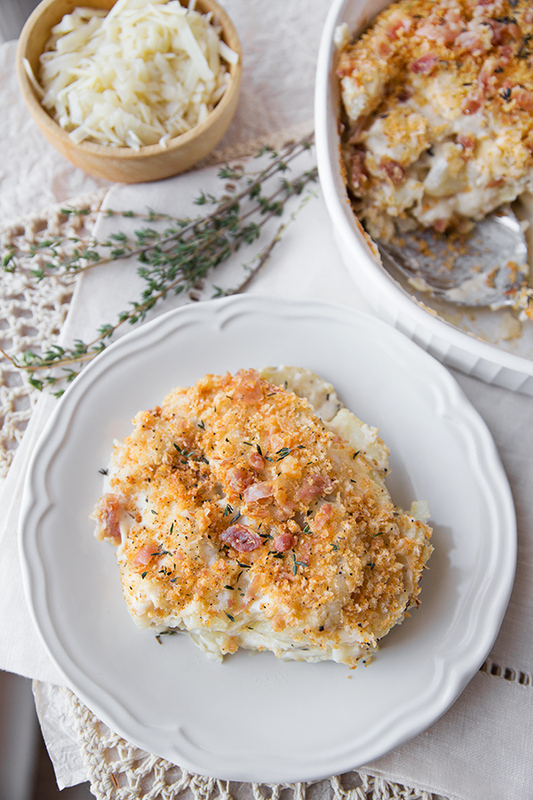 Potatoes au gratin is a rich and creamy potato side dish, and this delicious version offers four cheeses and crispy prosciutto to take things a little over the top! Isn’t it true that total and utter comfort food is exactly what we need sometimes? Potatoes au gratin most definitely rules supreme in the decadence department, and that’s just fine with me. When I’m looking for a special potato recipe to go with a special meal that I’d like to serve (perhaps even a holiday meal…), then these delicious potatoes au gratin are what I turn to. First, let’s start with super-flavorful potatoes; and for this recipe, I like to use Yukon Gold potatoes, a wonderful waxy kind of potato with incredible flavor and tenderness. Next, allow me to tempt you with the bells and whistles: I’m talking four kinds of cheese, fresh thyme, and a finishing topping of crisp prosciutto! Of course, I don’t simply pour cream or half and half over my potatoes au gratin. I prepare a simple yet super savory four cheese sauce, with a touch of garlic, to pour over top of my par-cooked potato slices. There’s no guessing here as to whether the potatoes are cooked through or not! And for a nice, crisp, golden-brown crust, I top everything with a seasoned panko mixture before baking. My recipes always call for extra love, and this one is definitely no exception—I think you’ll agree once you taste these! I begin by preparing my easy four cheese sauce, and keep that warm. My potato slices get par-cooked for a few minutes, just until barely tender. While I preheat my oven, I assemble everything in a prepared baking dish. I finish by sprinkling over the crispy prosciutto and fresh thyme leaves—then they’re ready to serve! All of it can be prepared ahead of time as well, which makes things easier. You would simply allow the assembled dish to cool before covering it with foil or plastic wrap, and then keep it in the fridge until ready to bake and serve. When you’re ready, you’d take it out of the fridge about an hour or two before you plan on baking and allow it to come to room temp. Or, you can prepare components such as the sauce and the crispy prosciutto, and even par-cook the potatoes ahead of time. Then, everything is ready to simply assemble the day you’d like to serve! Yukon Gold potatoes: I don’t like a lot of extra starch in my potatoes au gratin, so I choose to use waxy potatoes. Yukon Gold potatoes are a pretty yellow color and have lots of delicious flavor, but you can easily substitute red skin potatoes as well. Par-cook your potatoes: Because I’d prefer to not have to guess as to whether my potato slices are fully cooked-through and tender, I simply take the guess work out of it: I par-cook the potato slices for about 8 minutes, or until just barely tender when pierced with a paring knife, then drain. Getting cheesey: Because this is as decadent a recipe as it is, I like to use a combination of cheeses such as gruyere, mozzarella, fontina, and parmesan; but feel free to use only one or two, or your own preferred kind(s). Panko topping for crunch: Adding a crispy, golden-brown topping to potatoes au gratin is a good thing, so I mix together some seasonings with some panko breadcrumbs, and sprinkle that over top of the gratin before baking—it makes for a beautiful and delicious homemade au gratin potatoes! Crispy prosciutto: Crispy prosciutto offers a twist and a bit of a salty bite to this recipe, but you can also substitute bacon if more convenient. You crisp prosciutto the way you would bacon—just chop it, add to a hot pan, and allow it to become golden and crispy! 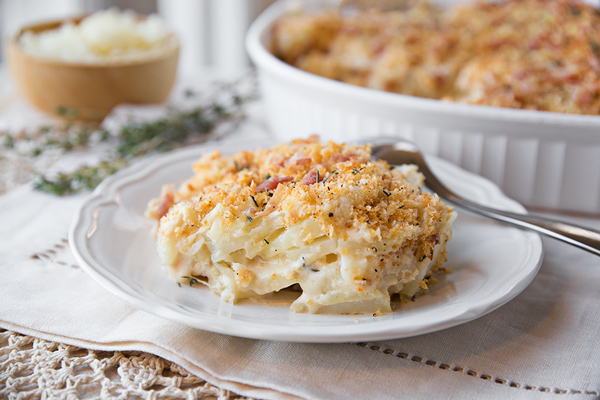 These rich, creamy potatoes au gratin have a few extra special ingredients added in to take them over the top and make them extra decadent! -Begin by preparing the sauce: place the half & half into a medium sized pot, and whisk in the remainder of the ingredients up to and including the paprika; place the mixture over medium-high heat and bring to the simmer, them turn the heat off. -Place another medium-sized pot over medium-low heat, and add in the butter; once melted, sprinkle in the flour, and stir together to form your roux (or thickener); continue to stir the roux for about a minute or two, to cook out the raw flour taste. -Next, pour the hot half and half mixture into the roux, whisking the whole time to prevent lumps from forming; allow the mixture to gently simmer for about 2-3 minutes to tighten up, and then turn off the heat. -Finish the sauce by adding in the cheeses and whisking those in until completely melted and blended, then sprinkle in the pinch of nutmeg and the fresh thyme leaves; keep warm. -Prepare the potatoes au gratin: preheat the oven to 350°, and spray a large baking dish with cooking spray, and set aside. -Place the sliced potatoes into a large pot, and fill with enough water to cover the potatoes; add in a couple of very generous pinches of salt to season the water very well, and bring the potatoes to the boil, then reduce the heat and simmer them until just tender, about 8 minutes (take care not to overcook the potato slices so they don’t break apart). -Carefully drain the potatoes, and allow them to cool enough to handle them. -Combine the gruyere, fontina, parmesan and mozzarella cheeses together into one bowl and toss to mix; set aside for a moment. -Layer about half of the potato slices on the bottom of the prepared baking dish, and pour about half of the sauce over them, smoothing it out to cover the slices. -Next, sprinkle over that about 2/3 of the grated cheese mixture, and repeat the process by layering the remaining potatoes over that, next adding the remainder of the sauce, smoothing it out, and then sprinkling over the rest of the cheeses. -In a small bowl, combine the panko breadcrumbs with a pinch of salt and black pepper, the pinch of paprika, and the olive oil. 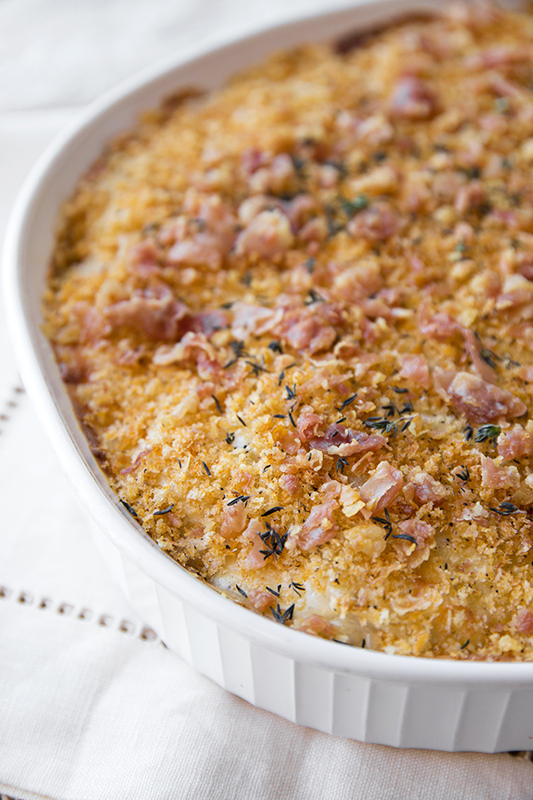 -Sprinkle the breadcrumb topping over the potatoes, and place the dish into the oven to bake for about 25 minutes; after the 25 minutes, if you have a broiler, put the broiler on high, and brown the top of the gratin for about 1-2 minutes until a deep golden color, keeping a close eye on it as to not burn it. -Finish by sprinkling over top the crispy prosciutto and the fresh thyme before serving. Hungry for more potato recipes? 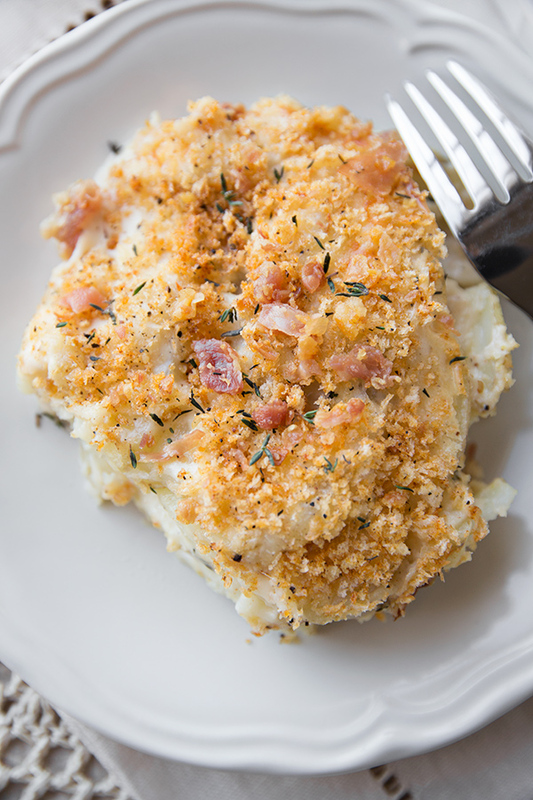 Check out these Roasted Potatoes, this Potato and Onion Gratin, or these Best Basic Mashed Potatoes! This looks amazing. You put some tlc into this dish and I bet they are the best potatoes ever. Lots of work, but it looks delicious. Thank you and Happy Holidays to you and your family. Wow, wow, wow! I made this tonight and loved it! It was a hit with the whole family! I will definitely make it again! Great flavor and so creamy! 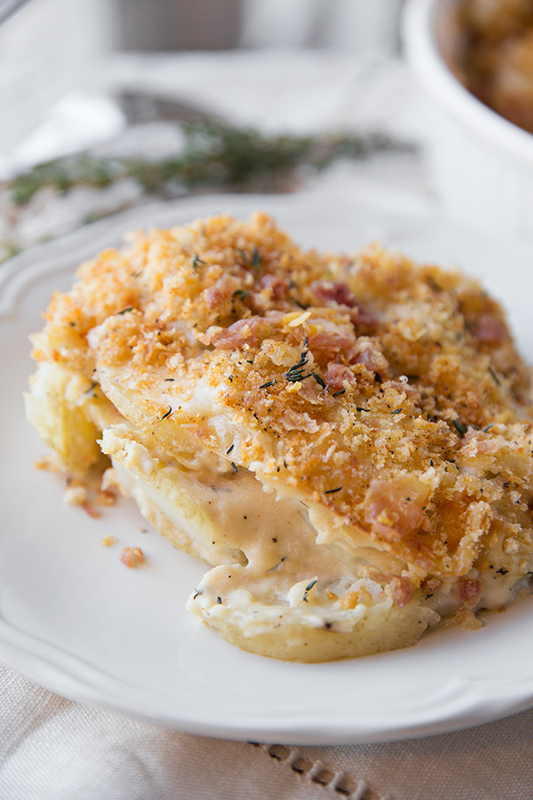 Hi Cindy, I’m was so excited to read that you gave this yummy potato dish a try, and that the whole family enjoyed it! Thanks for taking a moment to come and share that with me – happy cooking! Tis so hard to imagine a cold Christmas as our Christmas is a summer spectacle with BBQs, pool, pizza oven, surfing and camping. 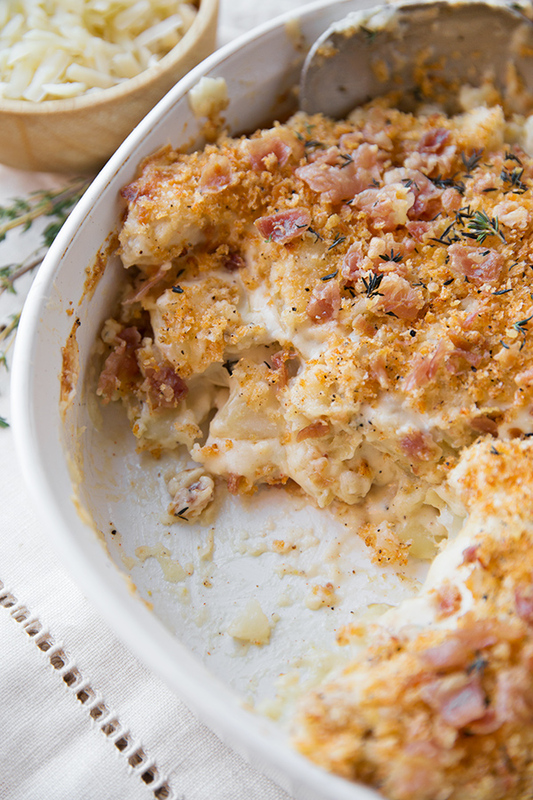 Your Potato Gratin looks divine and is on my winter menu list. Thank you. I’m thinking this would be wonderful for a group at Easter. How far in advance may I set this up? Hi Diane, thank you for your question! This would be perfect for Easter. You could prepare this the day before, making the recipe up to the point of assembling it in the casserole dish. (I would definitely allow the cheese sauce and the blanked potato slices to completely cool first before you layer everything in together.) Then, just cover the casserole dish with foil or plastic wrap, and keep in the fridge. Once you’re ready to bake it off, take it out of the fridge and allow it to become room temp for about an hour or so. Hope you enjoy! Could this be cooked in a crock pot? Maybe if I don’t cook the potatoes first? Hi Lanna! I couldn’t honestly recommend that you prepare this in a crockpot, as it wasn’t my method, and I’d frankly be guessing. If you’re proficient with using one, and would like to have a go, then I’d say give it a try. Otherwise, I’d stick to prepping this using the method above. Hello, Dear Ingrid! I hope you and Michael had a blessed and beautiful Christmas. Following Christmas dinner, we had enough ham and assorted cheeses (from our Antipasto Salad Bar) to feed a small army. I used your recipe here to make two 8×8 casseroles – one for my parents and one for a friend who had surgery yesterday. Even though Elena is a non-meat eater, she kept dipping potato slices into the (ham-laced) sauce. There’s not a sweeter feeling than seeing our loved ones enjoying what we create. Lately I’ve been trying to be very conscious of my emotions and intentions when I prepare food, even our morning coffee, imbuing and seeing only the highest good for the receiver. Have you read “The School of Essential Ingredients,” by Erica Bauermeister? I think you would like it. I am so happy to read you made this dish with some of your tasty leftovers, and I’m sending good vibes that the casseroles will be enjoyed by those precious folks who partake! I so agree with putting the right intention into cooking; if I’m in a bit of a “funk”, I’d rather not prep food at that time, if possible. I know that things are always more nourishing and nutritious when that love and good intention is present! And as far as the book, I am not familiar with it, but am super curious and excited to check it out. Right up my alley! Much love to you, and wishes for a wonderful and festive New Year’s Eve (and year!) to you and your sweet family! xoxo! Thank you so very much for sharing your experience with these tasty potatoes. Just goes to show that sometimes a little extra elbow grease makes a difference, especially when it comes to a recipe, and can yield results way beyond expectation. I feel blessed by your comment, and my heart is full that so many enjoyed the recipe and that you found such pleasure in that as the cook. That, truly, is the reward, as you mentioned! Happy cooking to you Caroline! May you find many more recipes here to share with those you love!